General Hospital (GH) spoilers for the episode on Wednesday, July 27, reveal that Maxie and Claudette’s battle over Nathan heats up, the danger’s not done on Cassadine Island, Alexis breaks down, Sonny calls out Julian, and Ava wants to make a big move. On Cassadine Island, the escaped hostages are far from safe. They may be out of the main house on the island, but that doesn’t mean they’ve found solace. In fact, they may be in more danger because Valentin Cassadine (James Stuart) has men all over the island. Valentin has ordered his forces not to allow the escapees to get off the island alive. The gang has a few guns among them, but that’s not enough – plus they’re hauling along an injured doc. Kevin Collins (Jon Lindström) worries that his wound is putting the others at risk. Kevin tells Laura Spencer (Genie Francis) that if it comes to it, she and the others should leave him behind and make their escape. Much as he threw himself in front of a bullet for her earlier, now Kevin is offering to fall on his sword. What a heroic male! If Kevin survives this, Laura is going to fall hard for the handsome and brave shrink. Ava Jerome (Maura West) doesn’t have a selfless bone in her body – no way would she sacrifice her own safety and she tells Dante Falconeri (Dominic Zamprogna) that they need to make a big move now. Lulu Spencer (Emme Rylan) recognizes her surroundings, but is it helpful information or will it freak her out? Lulu was held on Cassadine Island before, frozen, and had an egg stolen, so this is not a place of happy memories for Lulu. 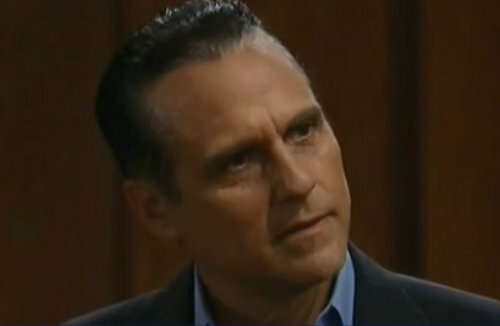 Back in Port Charles, Sonny Corinthos (Maurice Benard) can’t wait to go to court and mock Julian Jerome (William deVry) as he faces arraignment on murder charges. Sonny may be laughing now but it won’t be quite so funny if he ends up in Pentonville alongside Julian once again. Sonny doesn’t know that Paul is intent on coming after the Corinthos cartel next. Because Sonny has been helping the PCPD nail Julian, he may feel like he’s safe, but he is clearly not. Also, we see that Scott Baldwin (Kin Shriner) is repping Julian – guess he’s desperate for work. Claudette Bolland (Bree Williamson) and Maxie Jones (Molly Burnett) each engage in subtle warfare to take down the other one. Maxie has what looks like a flash drive and plans to use it to humiliate Claudette while Claudette goes directly to Nathan West (Ryan Paevey) to launch her scheme. Claudette tells Nathan she hasn’t been totally honest with him and offers an apology. General Hospital spoilers tease that Claudette will also offer a gift to Maxie which has Nathan’s fiancée scratching her head. At Crimson, Nina Clay (Michelle Stafford) makes a call and asks someone to get to the office ASAP. Is Nina calling in Maxie? Dillon Quartermaine (Robert Watkins)? Or is this demand for her new investigator Curtis Ashford (Donnell Turner)? Is this about the kidney mystery? All this and more on the Wednesday, July 27, GH episode. Watch and then check back with CDL for all the latest General Hospital spoilers and news. ‘General Hospital’ Spoilers: Lulu and Dante Both Cheating, Marriage Over – Does Lulu Sleep With Dillon? General Hospital (GH) Spoilers: Jean Passanante and Shelly Altman Dish Jason’s Future, Liz’s Redemption – Fans Surprised?